Welcome to my website! I'm a PhD Candidate in theoretical astrophysics and astrobiology at the Origins Institute at McMaster University in Canada. I build numerical models based on chemical, geophysical, biological, and astrophysical data to try to understand one of the most fundamental mysteries in the cosmos: how did life begin? My path to get here has been winding, but the variety of experiences I gathered along the way ultimately led me to the perfect career. I did my first undergrad in software engineering, after which I worked for an oil company in Calgary developing software. It wasn’t bad, but it also wasn’t something I loved—there was this constant inner conflict with myself about the negative contribution I was making to the environment. After a couple years working, I moved to Berlin. Something about the culture (and the beer) really attracted me. I worked for a tech company and met tons of people from around the world with similar stories: expats searching for answers. Somewhere in all that, I became enthralled with astronomy: I would be talking about it with friends, reading articles online, I even bought Feynman’s Lectures on Physics and began reading cover-to-cover. I realized this was what I was looking for, something to care about, to really explore. I returned to Canada and did an undergrad in Astronomy at UBC. From there I found McMaster through Dr. Pudritz, who is a part of the Origins Institute. Now, I consider myself privileged to be able to spend my days searching for answers to that age old question. Other things about me: I’m an avid fan of hot sauces and spicy foods, and in my spare time I homebrew beer. Check out the tab labelled “other” for some of my recipes. Our Paper Recently Won the Cozzarelli Prize! Ben K. D. Pearce (right) and Ralph Pudritz (left) holding the Cozzarelli Prize certificate after the National Academy of Sciences morning awards presentation. April 29, 2018. Washington, DC. Ben K. D. Pearce, M.Sc. I was interviewed on CBC Quirks and Quarks. Check it out below! Interested in what makes the sky blue… for humans? One of the deepest questions intelligent beings can ponder is, where did we come from? Evolution by natural selection explains how simple cellular life progressed into the diverse set of species we observe on Earth today, but it is still unclear how non-living, organic molecules converted into to something that can reproduce and evolve. Evidence is growing for the idea that if the right ingredients are settled in the right environment, life will arise naturally. My research focuses on the early stages of this hypothesis, beginning on the surface of our early habitable planet with only the basic starting materials delivered by asteroids and comets, or those readily available from simple terrestrial processes. For details, see my scientific articles at the bottom of this page! HCN is a key ingredient for forming the building blocks of life such as nucleobases and amino acids. However, atmospheric HCN chemistry is currently not well understood. The rate at which any reaction occurs is described by its rate coefficient. 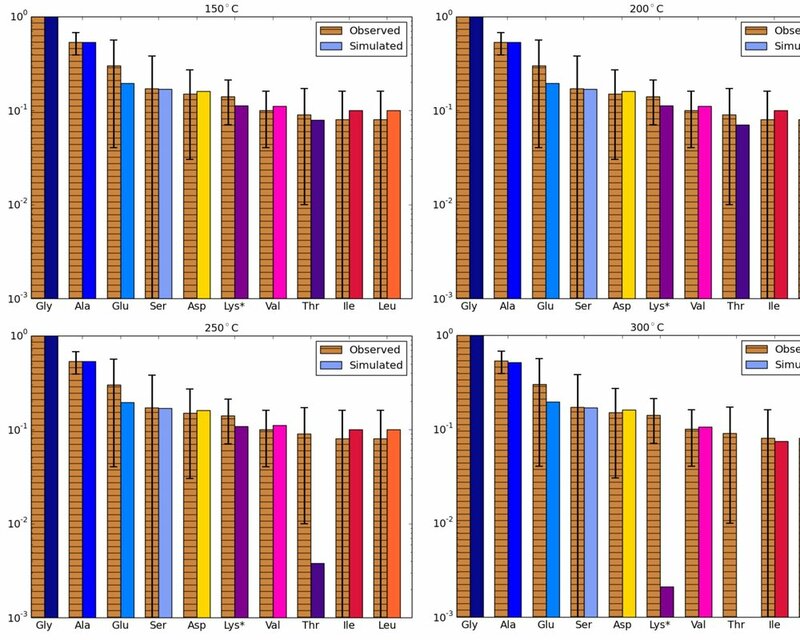 Using statistical mechanical and quantum computational methods, we calculated 42 rate coefficients involved in the production of HCN in early Earth and Titan atmospheres. These reactions are driven by leftover molecules from the breaking apart of methane and nitrogen by UV light and/or lightning. 15 of the reactions in our network have no previously known value. Above 47°C, the rate coefficient for the new reaction H2CN -> HCN + H dominates. evidence that life existed. From these two types of evidence, we can constrain the emergence of life to 4.5–3.7 billion years ago. There are two competing hypotheses for the site of the origin of life: hydrothermal vents and warm little ponds. Warm little ponds have seasonal wet and dry cycles, which have been shown to promote the chaining up of nucleotides into long genetic (RNA) molecules. Genetic molecules cannot form in environments constantly surrounded by liquid water, as is the case with hydrothermal vents on the deep ocean floor, thus warm little ponds appear to have the edge. We show, by building a comprehensive numerical model of warm little pond environments, that meteorites provided high concentrations of nucleobases to thousands of warm little ponds on the early Earth, 4.5–3.7 billion years ago. These nucleobases would then quickly react to form the first RNA molecules, setting the stage for first life on Earth. The first forms of life on Earth are thought to have been long chains of RNA (ribonucleic acid). These molecules are capable of making imperfect copies of themselves, and thus satisfy the simplest definition of life. There are 4 different building blocks of RNA, characterized by their nucleobase. Only 3 of the 4 nucleobases can survive in the early liquid-water interiors of asteroids and rocky comets, and be delivered to the early Earth by the fragments of these bodies. The origin of the other nucleobase remains elusive. Asteroids and comets formed in a disk containing basic molecules which froze onto grains. These grains contained Aluminum-26, which upon decay, releases heat. Thus the asteroids and rocky comets formed out of these grains were able to host liquid-water interiors for millions of years. These aqueous environments were ideal for forming amino acids via a well-known reaction pathway called Strecker Synthesis. Once delivered to the early Earth, meteoritic amino acids can act as catalysts for organic chemical reactions, and eventually be incorporated into the first proteins. Amino acids, the building blocks of proteins, and nucleobases, the building blocks of DNA/RNA have been detected in various carbon-rich meteorites. This provides evidence that these biomolecules can form chemically in some asteroids and comets (i.e. the parent bodies of meteorites), and therefore were a source of such ingredients to the early Earth.